When the ribbon cutting ceremony took place for the Gehl’s Performing Arts Pavilion on Wednesday evening, June 20, 2018, everyone in attendance knew it was more than just a cookie cutter civic event. It was a heart felt tribute to the Village of Germantown. 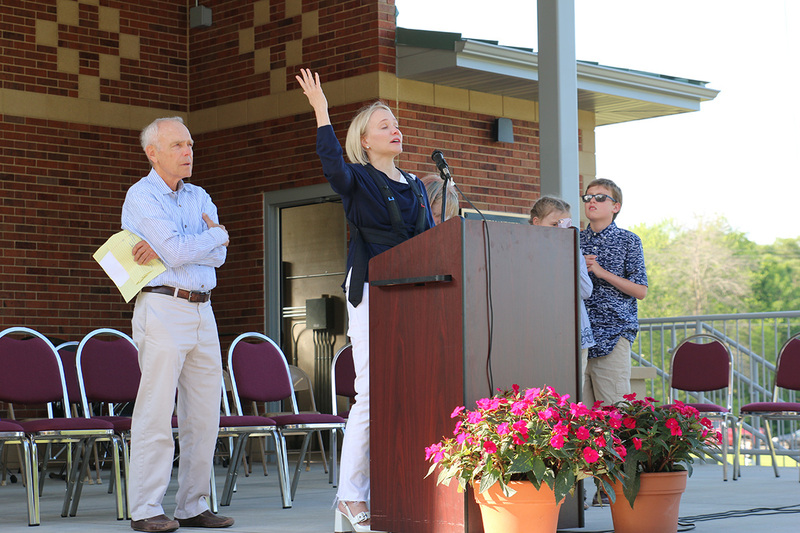 Katherine and John Gehl both delivered surprisingly emotional comments on the Germantown community they so wanted to honor. Dwayne Ketterer of the Germantown Kiwanis Club expressed his gratitude to the people of Germantown who helped the Kiwanis Club complete this project. 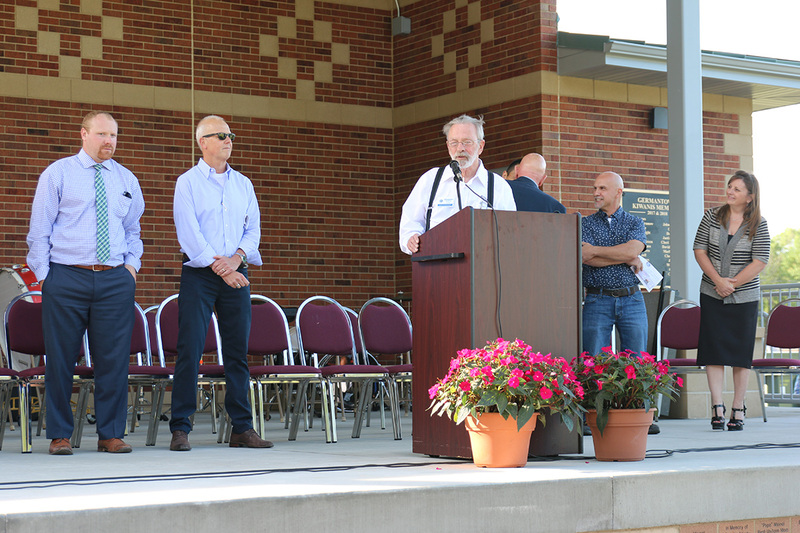 And Village President Dean Wolter gave praise to the Gehl Family for their sponsorship of the pavilion, and to the Germantown Kiwanis for their dream of building this beautiful concrete and steel constructed performing arts pavilion in Firemen’s Park. John Krause, the Kiwanis Club Vice-President who spearheaded the Performing Arts Pavilion project, told the crowd that over 500 Germantown citizens had contributed to building the pavilion. He said that when the Gehl Family put their support behind the project back in 2015 he knew this project would become a reality. Anniversary with a breakout performance, their first in the Gehl’s Performing Arts Pavilion. 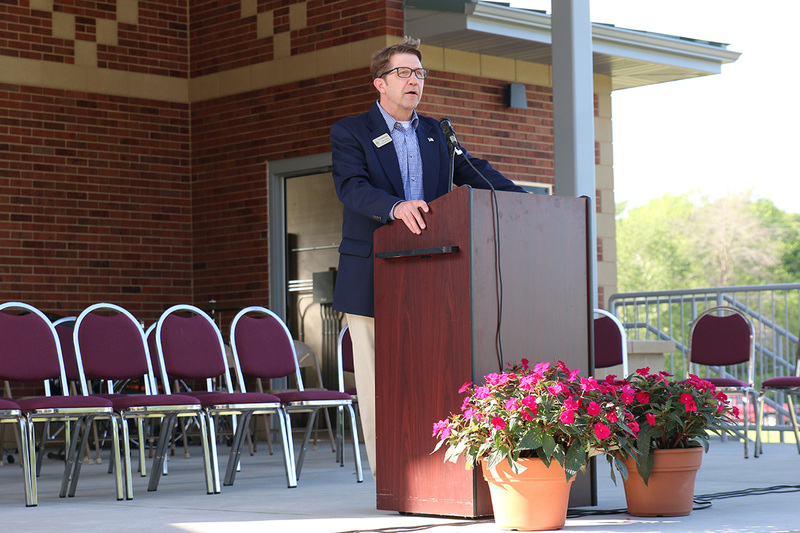 GCB director James Barnes noted how much they appreciated the opportunity to finally get to perform in the new pavilion. This was a much anticipated event for music lovers here in the Germantown area. The dedication was the first opportunity for many Germantown citizens to see the pavilion and note the sponsorship plaques which have been mounted on the pavilion walls. Even more interesting are the sponsorship “bricks” which were purchased by area citizens now prominently embedded along the foot walls of the pavilion stage. The Kiwanis Club is both proud and excited to see the Gehl’s Performing Arts Pavilion standing at the northeast corner of Firemen’s Park. This eight-year project was shepherded by members of Germantown’s largest local service club. 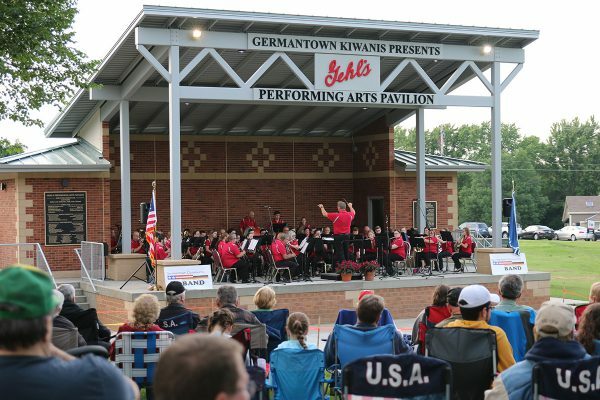 Later this summer, on July 26, 2018, the Kiwanis Club will hand over the keys for the pavilion to the Village of Germantown at their flagship event, A Taste of Germantown here in Firemen’s Park. A Taste of Germantown is a “Party in the Park” for the whole village. Food, entertainment and children’s activities will be enjoyed by all. All Germantown residents are invited to attend. The Gehl’s Performing Arts Pavilion is located next to the Germantown Senior Center in Firemen’s Park.